Gold traders expect demand to pick up during the festival season. 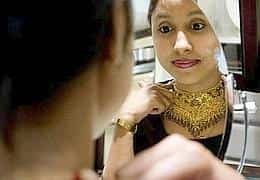 New Delhi: Indian gold jewellery buyers have been put off by prices at 16-month highs despite the arrival of a season of festivals when demand usually peaks, but the expectation of a further rally is seen pulling in investors. “Nobody is coming for fresh buying. Only those who have a compulsion, such as a wedding in the family, are purchasing gold jewellery," said Ajay Singh Shekhawat, a partner at Kiran Jewellers, which has outlets in three Indian cities. Spot gold touched a high of $726 an ounce on Wednesday, its highest level since May 2006. At 0400 GMT, it was trading at $722.10 an ounce. Jewellery accounts for 80% of India’s gold demand. Accompanying the fall off in retail interest, bullion dealers are seeing a similar decline. He said a pickup was expected from mid October — with the end of a period considered inauspicious by many Hindus — provided prices remained stable at close to $730 an ounce. Despite sales losing their lustre a strengthening rupee and the prospect of greater investment buying have cheered some. India imports nearly all of its annual gold demand of 800 tonnes. The Indian rupee rose to its highest level in nine years, climbing to 39.90 per dollar at 0440 GMT, compared with above 45 rupees at the same time last year. “High gold prices may not deter consumers so much as the rupee is strengthening against the dollar," said Rajiv Popley, director of Mumbai-based Popley & Sons. However, the price surge has begun to weigh on import demand. “Gold imports were going fine until August, but the jump in prices has begin to now squeeze the demand," said a senior official of the state-run MMTC, India’s leading gold importer. He said that 17 tonnes of gold had been imported last month, but volumes could fall by 25% this month. Analysts said the fall in retail demand may be partially offset by investors anticipating a further rise in prices. “Traders and those looking to diversify their portfolios may buy at current levels," said Gnanasekhar Thiagarajan, director of Mumbai-based Commtrendz Research. He said gains from a rally in India’s main share index to a record-high of 16,139.52 points may end up partly in gold. Thiagarajan and others expect overall demand during this year’s festival season to beat the year ago figure, but he did not give quantities. India’s peak festival season commences with Rakhi, which celebrates the bond between a brother and sister, held at the end of August, and culminates with the festival of lights, Diwali, in November. It is traditionally considered auspicious to buy gold during these festivals. India’s gold consumption between October to December 2006 was at 207.7 tonnes, according to the World Gold Council. “I don’t see any negative impact, so long as prices remain stable," said Keyur Shah, associate director of the council’s India office. Some traders said the price surge may prompt retail consumers to make smaller purchases, while more gold scrap, or secondary gold, may be sold. “Many jewellers will reduce their inventories to take advantage of the high prices," said Girish Choksi, an Ahmedabad-based bullion dealer.